Have a design and want your sheet metal work manufactured in the UK? Come and talk to our friendly engineering team here at V and F Sheet Metal. We will be happy to help you with your new design ideas or review ways to save money on existing projects. 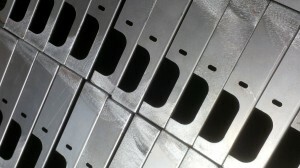 Sheet metal work covers such a wide range of manufacturing techniques and materials. From the smallest spring clips through mild steel and stainless steel brackets right up to fully welded aluminium housings. From components just 0.3mm thick up to support brackets and mounting plates 8mm thick. They are all sheet metal work and we support our UK customers in all of these areas. I’ve shown just a few simple parts to illustrate how many production processes go into manufacturing sheet metal work. These parts are made from mild steel, stainless steel and aluminium. Some have been CNC punched and some laser cut. 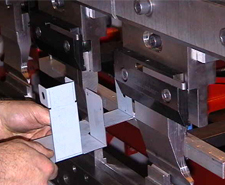 Some parts have been folded on CNC press brakes with standard V blocks. The stainless steel parts have also been formed into curved shapes with simple form tooling. And finally the mild steel brackets have been spot welded to spring clips. You might like to view hundreds of past sheet metal projects for inspiration with your new sheet metal design, our Pinterest Boards are a great place to start. 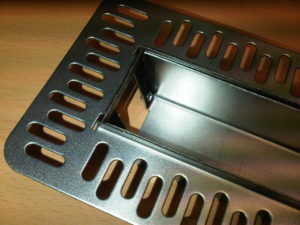 Sheet metal work manufactured in the UK can be competitive with sheet metal work from the far east. If you have small batches, urgent turn around times or complex parts that you want to talk through in detail the UK is the place to look for you sheet metal work. With the right tooling and design ideas sheet metal work manufactured in the UK can be the perfect fit for your company. Call us on 01489 577786 or e-mail your drawings to sales@vandf.co.uk and we will be happy to help you. 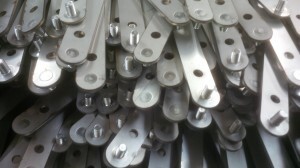 Sheet metal assemblies manufactured to improve your competitive advantage. No matter what type of assembly work you are looking for we will be happy to help. From the simplest spot welded mild steel chassis with brackets right up to multi-part fabrications. We are happy to look at your designs and work with you to make them suitable for manufacturing. Our Pinterest boards have thousands of examples of past sheet metal projects, many of them are assemblies. Please take a look for yourself, I welcome any feedback or use them as a starting point for your own new designs. In conclusion, we are here to support you with our experience in sheet metal design and manufacturing not just to make to your drawing. If you want to chat over some ideas you might have on your sheet metal assemblies just give us a call on 01489 577786 and we will be happy to listen. 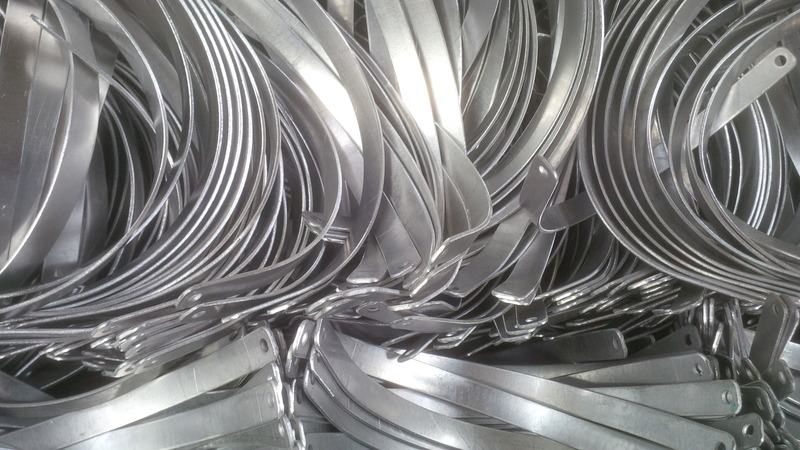 We have been manufacturing sheet metal work for our custmomers in Great Britain since the 1980s. Based in Fareham, Hampshire right next to the M27 we are perfectly located to service our customers in Hampshire and beyond. Whether you want small mild steel boxes manufactured to your own design of you would like us to help you with development we are ready. Using Radan CAD/CAM software to control our CNC punching and laser machines we can cope with the simplest mild steel box right up to fully welded sheet metal fabrications. Both of the housings you can see here have been TiG welded and were still waiting to be cleaned up. The larger boxes would eventually be powder coated and the smaller zinc plated and colour passivated. We have been supporting companies in Great Britain for many years with projects just like these. Small batches and special projects right up to many thousands of parts at a time. These sort of projects are just what we are here to help you with. We have plenty of other examples of sheet metal fabrications on our Pinterest Board. Once you know what you want to have manufactured you just need to call our sheet metal fabrication team on 01489 577786 for assistance. alternatively you can e-mail us at sales@vandf.co.uk and we will sort out your 2D or 3D data. Sheet metal manufacturing projects can come in all sorts of shapes and sizes, so let’s take a look. 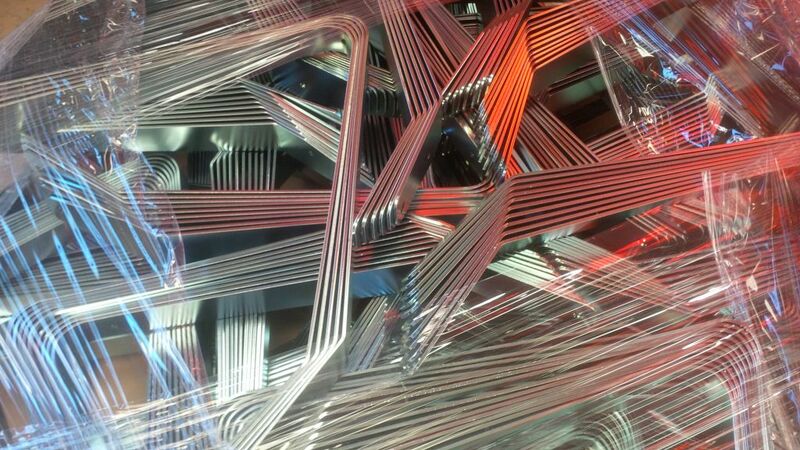 When creating a a complex shape with curves in sheet metal a form tool can sometimes be a solution. Being able to press a shape in one operation will always save production time and therefore money. Working with the customer we were able to construct a form tool created from laser cut laminates. Saving the cost of expensive solid tooling is always a good idea. With the ability to make changes to shapes and tooling this is a powerful technique for small batch sub-contract engineering. Some sheet metal manufacturing projects are perfect for us. 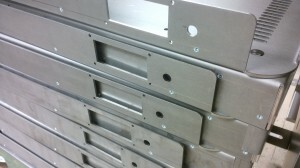 Using CNC punching and CNC bending these thin gauge zintec brackets are a typical sheet metal project. Apply our latest manufacturing processes we soon had these parts sorted. The biggest advantage for us is the ability to change design details whenever needed without tooling costs. A simple change to either a CNC punch of bend program that can take just a few minutes is all that’s needed. This sheet metal project was a collaboration with the customer. They free issued the machined solid steel blocks and pins. 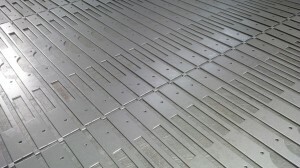 We manufactured the mild steel plates with our laser cutter and then welded them together. We also organised to have the finished assembly zinc plated. If our recent sheet metal manufacturing projects have whetted your appetite then please feel free to explore our website further. You may however already have a sheet metal project in mind, please call us and we will be happy to help you. 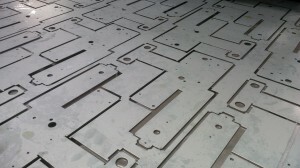 Again, this month we have been busy laser cutting sheet metal projects. From small clips and angle brackets in 0.7mm stainless steel to 6mm thick mild steel and 5mm thick aluminium and everything in between. One particular project was interesting when we were asked to laser cut replica sword blanks to be used in film work. You just never know what’s coming next in sub-contact engineering. 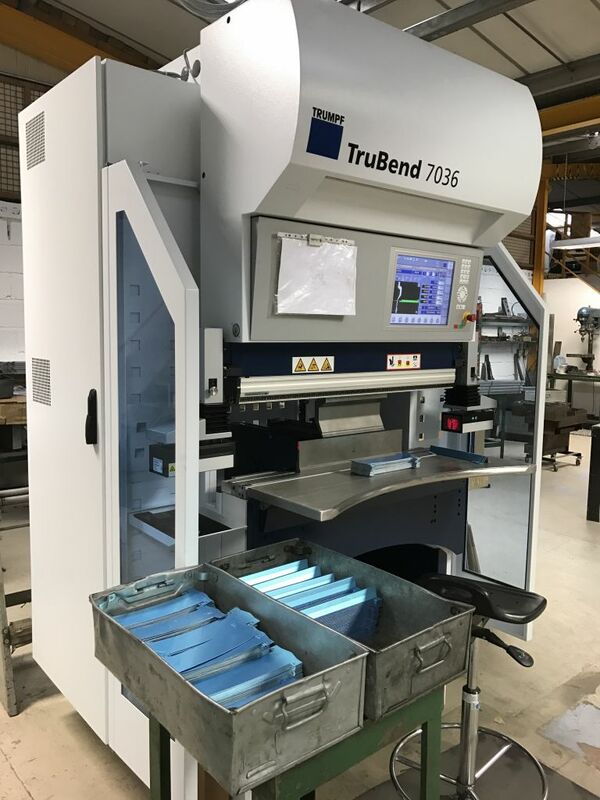 We were really pleased to have another brand new Trumpf 7036 CNC press brake join the ranks of bending machines we use here in Fareham, Hampshire. There were so many bending sheet metal projects in March 2017 that the new machine helped with. Having already used two of the these machines before we had all the old CNC programs ready to go as well as the tooling. With the purchase of new tooling to expand our tooling library the machine was up and running the same day it was delivered. 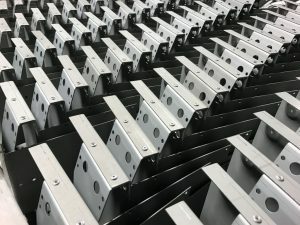 These formed sheet metal chassis are just typical sheet metal work that we make for out UK based customers and were just another one of the sheet metal projects in March 2017 that were completed in the UK. If you are looking for a new sheet metal worker then please take a look at our website and the services we can offer you. We are constantly investing in new technology to help improve the manufacturing processes we can offer you. From the latest CAD/CAM software (we have Radan 2017) to a brand new Trumpf 7036 CNC press brake (installed March 2017), these are exciting times. If you have a set of drawings you want us to review for you please send them through to sales@vandf.co.uk. We are happy to offer alternative prices even if it’s just a costing exercise to check that your current supplier to competitive. Perhaps you want to have a chat to check out your designs are suitable for manufacturing. Our manufacturing team is here waiting to help you, call us on 01489 577786. What is sheet metal fabrication and where can I buy it? So what is sheet metal fabrication and where can I buy it? Sheet metal fabrication is a term that covers a wide range of manufacturing activity. For us here at V and F Sheet Metal it can range from laser cutting and CNC punching ferrous and non-ferrous metals. Bending and forming the sheet metal blanks into a range of shapes and sizes. Inserting captive fasteners to aid assembly. Welding and cleaning up to powder coating, zinc plating and anodising to name but a few processes. 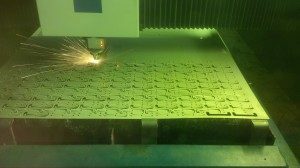 Using laser cutting is a very flexible tool when it comes to producing sheet metal fabrication blanks. With a fibre laser we have the ability to not only cut traditional ferrous and non-ferrous metals but also yellow metals such as copper and brass alloys. 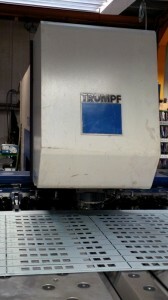 We use a Trumpf 3030 3KW fibre laser for all our laser cutting needs and its a very versatile machine. Nearly all our sheet metal fabrications that are not simply flat will be folded on one of our 7 CNC press brakes. This range of machines allow us to efficiently bend components from just a few mm wide to 3000mm long. CNC press brakes are an effective way of folding sheet metal fabrications with standard tooling. They enable CNC programs to be written and then used again and again for future batches without wasting any time. Today’s CNC press brakes are fast, very accurate and easy to set up. 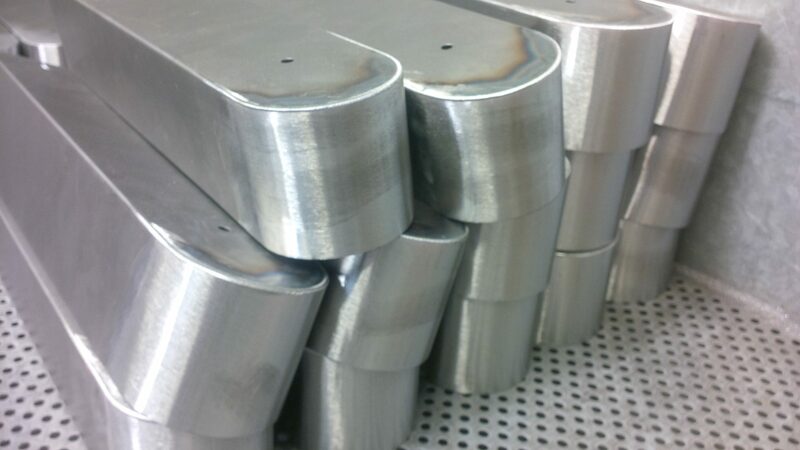 They are suitable for prototypes, small batch work and higher volume sheet metal fabrication. Spot welding and conventional TiG and MiG welding techniques are used to produce sheet metal fabrications. We can weld steels, stainless alloys, brass, aluminium alloys, zintec and galvanised steel. 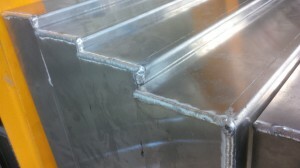 Most commercial welding techniques can be used to produce your sheet metal fabrication work including stitch, tack and seam welding. 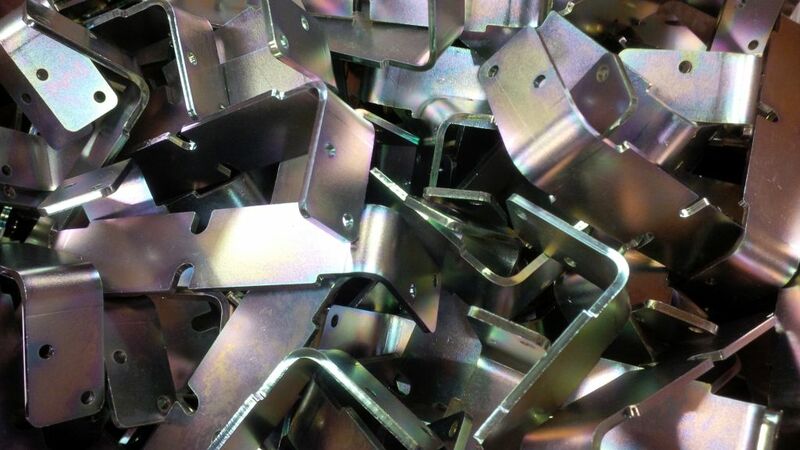 The manufacture of small sheet metal brackets is a speciality for us here at V and F Sheet Metal. 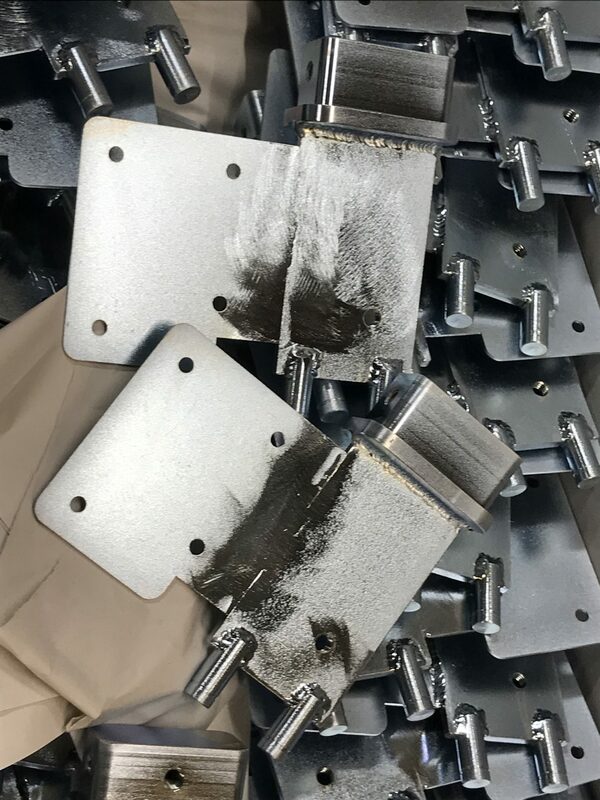 With laser cutting and CNC punching feeding our wide range of CNC press brakes a day doesn’t go by when we are not making sheet metal brackets. Although most sheet metal folding consists of tight bends produced in simple V bend tooling there are times when larger curves are needed. 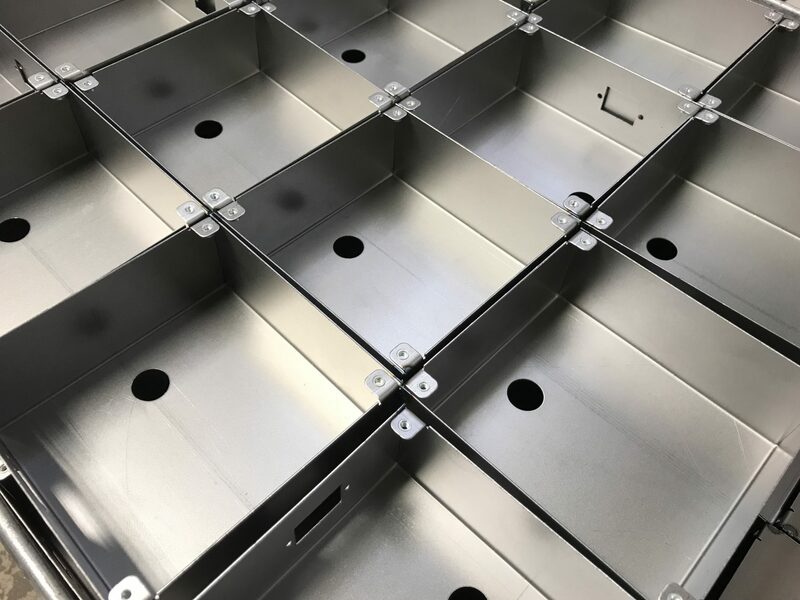 We have a range of in house tooling that can be used to produce your sheet metal fabrication profiles and these chassis nicely demonstrate this feature. Here’s a typical example of sheet metal fabrications manufactured by us in 2017. They are made from 1.2mm thick 1050a aluminium alloy, they have been CNC punched, had the sharp edges de-burred and folded on on of our Trumpf 7036 CNC press brakes. They are waiting to be tack welded together before going off to be powder coated. 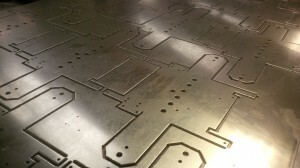 CNC punching has been the main manufacturing technique we have used for producing sheet metal blanks for years now. With the ability to produce complex shapes in a range of metals and form interesting shapes such as dimples, ventilation louvres, threaded holes etc. 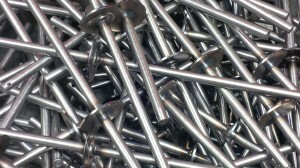 they are the main stay of our sheet metal fabrication. Now that we also have a laser cutting machine they is virtually no shape we cannot produce. We are very proud to now have 3 Trumpf 7036 CNC press brakes, one was newly installed in March 2017. With our 4 other CNC press brakes this provides a wide range of processing ability and capacity to cope with small and large batch of sheet metal fabrication folding. Just another day at V and F Sheet Metal, a range of fabrication sizes and volumes waiting to be folded up. 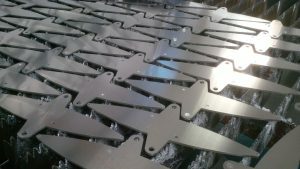 We have a team of people who CNC program parts for laser cutting, CNC punching and CNC bending. We also have to keep production moving with the correct materials, gasses and customer data. 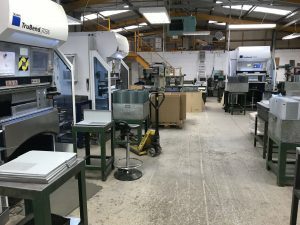 You can be sure that we keep a close eye on all work going through our factory to see where we can improve processes and suggest ideas to our customers to save time and money. What is sheet metal fabrication? Well this has to be it. A mild steel fabrication that has been CNC punched, de-burred and folded up on a CNC press brake. 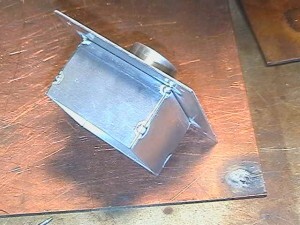 The curved end caps have been rolled up and then all the joints and been seem welded together. The final fabrication was then clean us using a range of hand tools to produce a smooth outer surface. 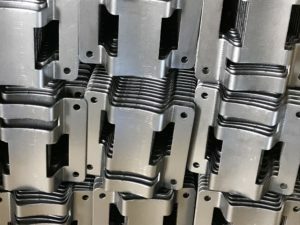 This blog post is only a quick survey of the techniques used in manufacturing sheet metal fabrications. For a more in depth study why not read our “What is sheet metal work and how is it made?” pages. If you are looking for a sheet metal working company that is capable of manufacturing your work in aluminium then please give us a call. We can laser cut and CNC punch your aluminium sheet metal work as well as CNC bend and weld fabrications using TiG and MiG welding techniques. 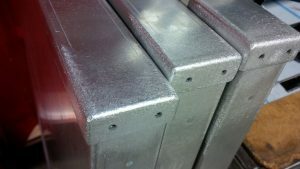 Aluminium sheet metal work along with mild steel and stainless steel is a service we offer to a large range of companies in the UK. 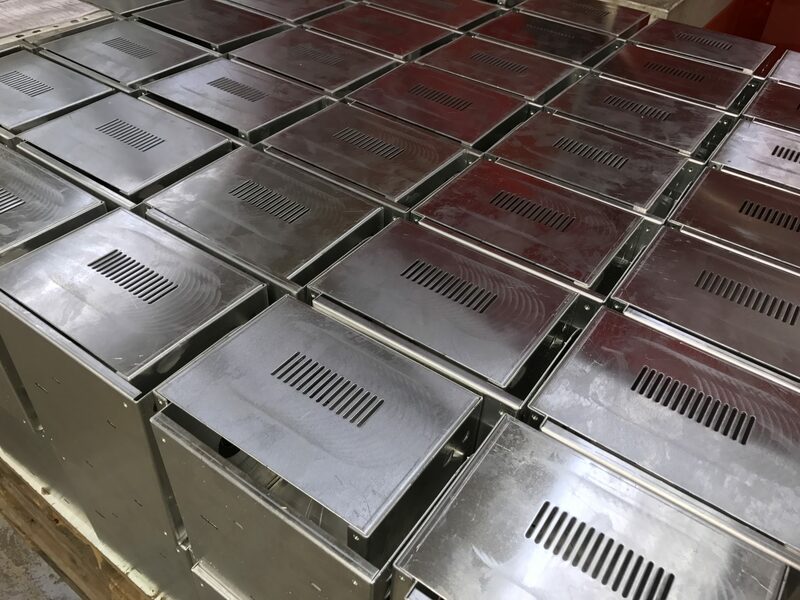 We manufacture a wide range of aluminium sheet metal work including electronics front panels, brackets, housings and chassis components. These aluminium welded fabrications have been manufactured to be used with a ceiling system to support light fittings. After this image was taken we cleaned off the welds and powder coated each aluminium housing matt black to the customers specification. There were 200 aluminium housings that were produced for this specific customer order but we can manufacture much larger batches if that is what you need or just a few parts for small orders or prototypes. 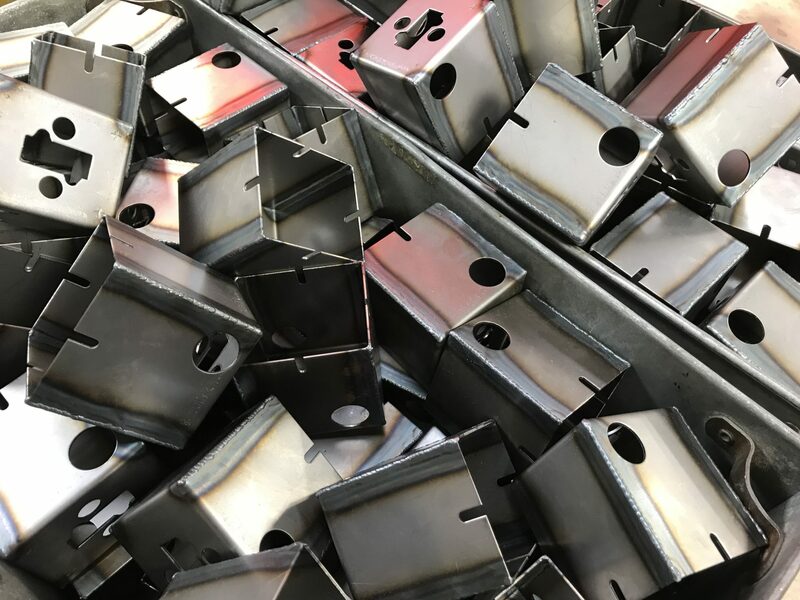 V and F Sheet Metal have been based in Hampshire UK for over 30 years growing in the range of sheet metal fabrication services we offer our customers. In that time we have built up a sheet metal working service for a huge range of companies right across the UK. As well as CNC laser cutting, CNC punching and CNC bending we can offer a wide range of ancillary manufacturing services. You just have to take a look at our website to see the comprehensive range of services offered. With the latest CNC sheet metal working processes covered in house we are proud of the service we can offer you. A good starting point is to look at our gallery pages to see the range of sheet metal components and sheet metal assemblies we manufacture. We are often called upon to simple supply sheet metal components to our customers drawings and that is fine with us. Some of our customers will want us to arrange to have their components powder coated, zinc plate or anodised which again is not a problem. 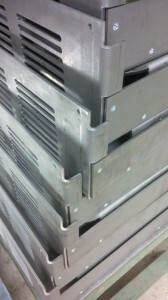 We do also get involved with sheet metal fabrication assembly work. This maybe simply spot welding several parts together to create custom built sub-assemblies. Parts maybe welded together to create complex fabrications in ferrous or non-ferrous materials. 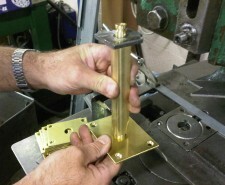 We are also asked to pop rivet parts together so final assembly is much quicker for our customers. 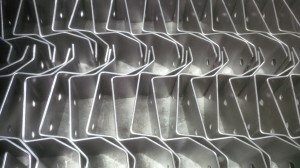 The sheet metal fabrications shown here have been CNC punched, CNC folded and then pop riveted together. These assemblies are part of a control gear tray in a large industrial light fitting for one of our UK lighting customers. The method of assembly you want will depend on the needs of your product but we can support simple hollow and solid pop riveting, spot welding, tack welding, solid riveting, assembly with self tapping screws etc. It’s easy for us to provide you with prices with and without assembly so you can see which way you want to go in production, we are here to help you during the whole design to manufacturing cycle. You can always give us a call or e-mail our engineering team to discuss your ideas and how we can support you to speed up the production time for you designs. Today I thought it would be good to show off a couple of welded sheet metal fabrications that have been recently manufactured. As well as TiG and MiG welded sheet metal fabrications we often get involved with supplying our customers with spot welded fabrications. These zintec cages have been CNC punched out on our Trumpf 3000R CNC punch press and then folded on one of our CNC press brakes. The final manufacturing operation was to spot weld together folded flaps to the side panels to create a complete strong cage. 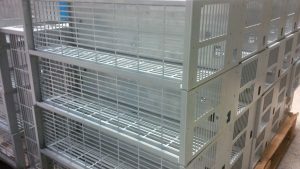 These cages were then powder coated before shipping to our customer. These aluminium cases and end caps are typical of the welded sheet metal fabrications produced here at V and F Sheet Metal. They have been CNC punched out and folded up before having their corner joints TiG welded. The final manufacturing operation was to clean off the welds so that they were nice and smooth ready for powder coating. Once they were powder coated there was no witness of the welding or cleaning up operations. 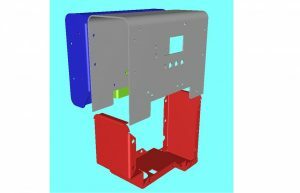 Both the spot welded enclosures and the TiG welded aluminium cases have been CNC programmed using our Radan sheet metal CAD/CAM software. The software is great at enabling us to experiment with initial 3D model design ideas, laser or CNC punching tooling options, the best corner treatment for bending and welding and nesting the most parts for a given sheet of metal. Please contact us and we will be happy to discuss the right time to use spot welding or Tig / MiG welding in you sheet metal designs. If you are happy that you have the right solution please send your drawings to sales@vandf.co.uk and we will be happy to produce estimates for you. Here’s a great example of a sheet metal laser cutting project we have produced for a customer of ours using 5mm thick 5251 aluminium alloy. 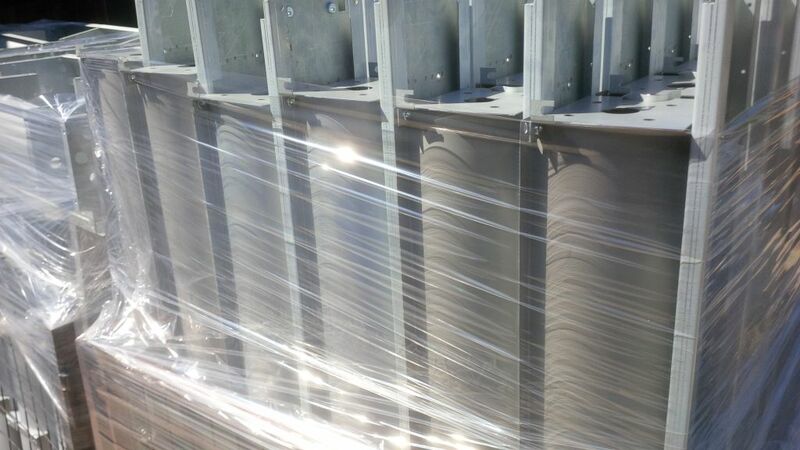 These components were used to create an end cap for sections of aluminium extrusion on a building project. The Trumpf 3030 fibre laser cutting machine we use made quick work of these parts cutting all features with nitrogen for a clean edge with minimal de-burring needed on the reverse edges. You can see for yourself just how effectively the parts can be laid out on the sheet to get the best possible material use and cheapest price. Another sheet metal project that was manufactured in August 2016 was to make a series of zintec coated mild steel components and then spot weld them all together. 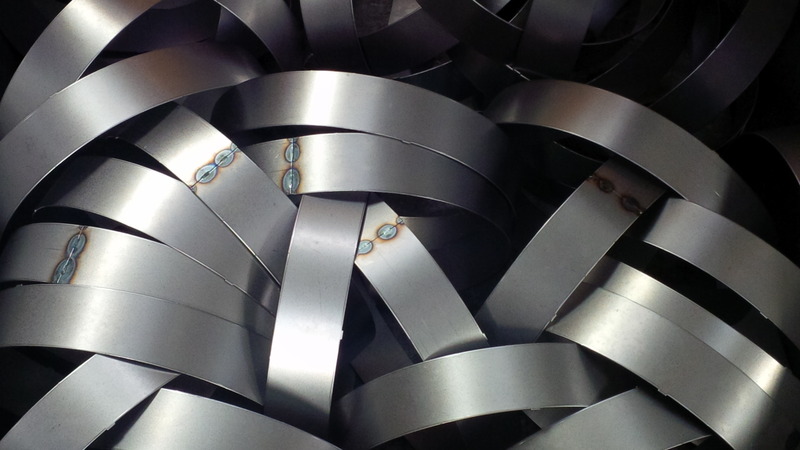 These spot welded assemblies are used in an air conditioning unit and we often make in batches of 50-100 at a time. All the parts have been CNC punched, CNC bent and then spot welded to make up the fabricated assemblies and they are typical of the sheet metal projects we have manufactured during August 2016. These zinc plated components have been laser cut from 3mm thick mild steel and formed to shape using standard CNC press brake tooling. We used oxygen as the cutting assist gas on these parts as any sign of edge oxidisation will have been removed in the zinc plating treatment process during the first acid dip stage. All these sheet metal projects were manufactured during August 2016 in our factory in Fareham, Hampshire, UK. If you have a sheet metal project that you want to review or perhaps a new sheet metal project that you wish to have an estimate for costing then please give us a call on 01489 587776 or send our sheet metal engineering team your drawings to sales@vandf.co.uk. We can accept DXF, DWG, PDF, STEP and SAT files direct from your design department. Looking for a sheet metal working company that can deliver a reliable sheet metal work service in the Bournemouth region of Dorset. 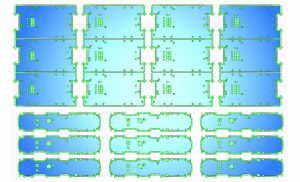 Using 3D solid modelling with Radan sheet metal software is a great way to ensure that components align correctly before having to cut any sheet metal. Any problems with the customer’s design can be highlighted and corrected before committing to production. The correct developed blank sizes can be generated from the 3D model allowing for material thickness, material type and the production machine being used to manufacture the parts. V and F Sheet Metal have been using Radan 3D solid modelling software since 2001 and have lots of experience in handling complex models, assemblies and fabrications for their customers. Here we have an image of developed blanks within a CNC punch nest for our Trumpf 3000 machine. Using Radan sheet metal CAD/CAM software we can layout the individual parts, tool them for CNC punching and produce the most efficient CNC punching nest to get the best fit of parts from a sheet of metal. All CNC programs are held on our system server so they are ready instantly for any repeat batch work or design issue changes. The final sheet metal chassis and cover have now been CNC punched, edge de-burred, folded and had their inserts pressed in. All holes align perfectly and the job is ready to be shipped to the customer. 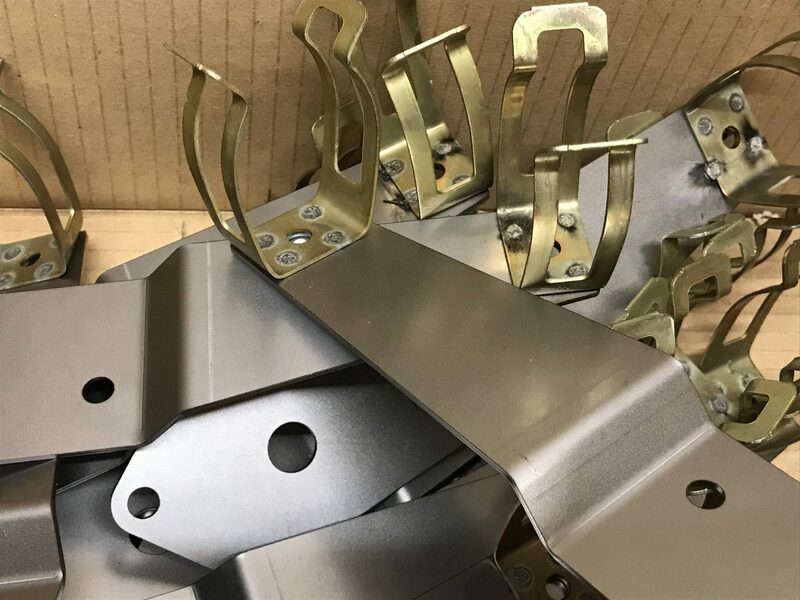 These parts have been produced in batches of 100 parts and are typical of the sheet metal work that we produce every week for companies right across the UK. If you are looking for a sheet metal working company to help you with your designs and make the parts simpler to reduce production costs please give us a call on 01489 577786 or e-mail your drawings to sales@vandf.co.uk and we will be happy to help you. A range of sheet metal brackets manufactured for the Romsey area in Hampshire, UK. If you are based in the Romsey, Southampton or Eastleigh areas of Hampshire, UK then V and F Sheet Metal are just 30 minutes away from you. 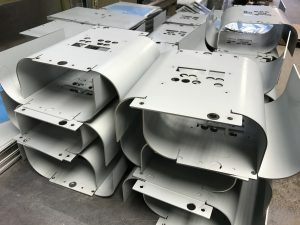 Having manufactured sheet metal work for over 30 years including, sheet metal brackets, boxes, housings, enclosures and rack mount enclosures, lighting reflectors, front panels, fixing plates, support angle brackets, channels, angles, welded fabrications and press work, there isn’t much that we cannot manufacture for you. If you want to pop in and discuss your sheet metal project we will be happy to see you and show you around our 13,000 Sq. Ft. busy sheet metal production factory based on the Segensworth industrial estate near Fareham and explain the sheet metal services we can offer you. So if you have a range of drawings you want to send us from PDFs or DXF, DWG files right up to 3D STEP and SAT files please just send them to sales@vandf.co.uk and we will be happy to advise you on your design and offer some very competitive price options. Looking for sheet metal workers in the Chandlers Ford area? Here at V and F Sheet Metal we support companies right across Hampshire UK with a comprehensive sheet metal fabrication service. With customers regularly delivered to in Chandlers Ford, Eastleigh, Southampton and Winchester as well as next day overnight small packet and pallet deliveries right across the UK. If you have a one off sheet metal work project you need assistance with or a more regular production requirement we will be happy to help you. Contact our engineering team for advice of designing for efficient manufacturing of sheet metal components. Want to pop in and discuss your needs or see in more detail the services we can offer you, just give us a call. The 2 parts shown here are just typical of the many thousands of items we manufacture every month from our 13,000 sq. ft. factory in Fareham, right on the M27. 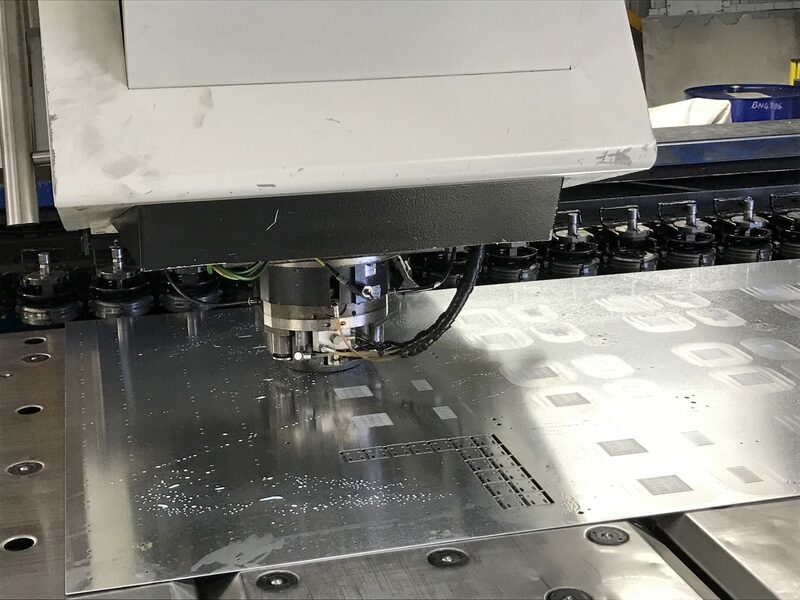 Using the very latest CNC punching and fibre laser cutting production processes to produce sheet metal blanks quickly and accurately to a price that you need. Along with 6 CNC bending machines, up to 3M long and 100 tons force, we have great flexibility when it comes to that rush job you just have to get out. Looking for sheet metal workers in the Southampton area? Based in Fareham right on the M27 we are perfectly positioned to supply sheet metal work and welded sheet metal fabrications to companies in the Southampton area. Working with a vast range of ferrous and non-ferrous materials we are happy to CNC punch thicknesses from 0.3mm right up to 5mm thick with our two Trumpf CNC punch presses, over 5mm we can easily handle with out Trumpf fibre laser. These particular aluminium CNC punched panels were made for an electronics company who used them to house control gear on pumping systems. Whether it’s small electronics housings and front panel, lighting modules or gear trays, support brackets or welded fabrications we are here to help you. 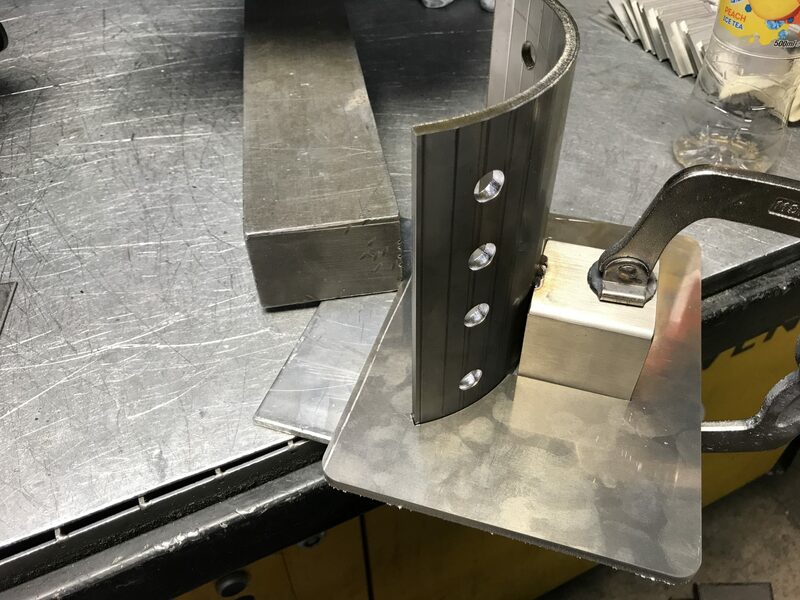 Here we have a typical small stainless steel bracket that we have just manufactured for one of our customers in Southampton. These components have been laser cut and have stainless steel PEM studs pressed in the ends, once they had been folded up they were used in conjunction with a small battery power portable LED lighting system. Whether it’s a few prototypes for a new design you are working on, repeat batches of sheet metal work or higher volumes we can cope with your needs. So if you are looking for sheet metal work and you are based in the Southampton area please give us a call or pop in for a look around and see the range of services we can offer you. Here’s an unusual project for us here at V and F Sheet Metal, a welded plate and bar fabricated assembly. The bars have been machined from mild steel and free issued to us. 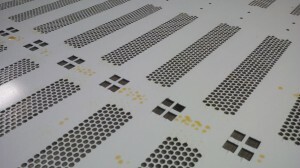 We laser cut the circular plates and then welded them in plate as you can see in the image here. Finally we had the welded assembly zinc plated and colour passivated. The final welded fabrication was used to support light fittings in the ground. 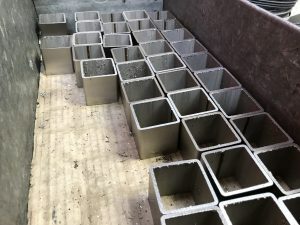 Although we predominately produce our work from sheet metal in ferrous and non-ferrous alloys we do also make up fabrication like this when needed for our customers. When you are a sub-contract engineering company you have to be able to turn your hand to any project that comes along from your customers. Perhaps you are looking to have a welded fabrication project manufactured in the near future, please give us a call and we will be happy to help you. A simple rolled mild steel ring for a light fitting manufactured from 0.9mm thick material. This simple component has been CNC punched from sheet metal, rolled into a ring and then stitch welded at the joints to produce a circular band. Once the bands were all welded together they were then welded to a perforated disc to produce a vented top panel for a high bay light fitting. If you look carefully at the picture you can see small tabs on the edges of the rings which have been designed to engage in slots on the perforated rings to speed up welding alignment. You will see this technique again and again in our blog posts as it’s such a powerful way of ensuring accuracy in welding and speeding up production rates without costing a lot of money. 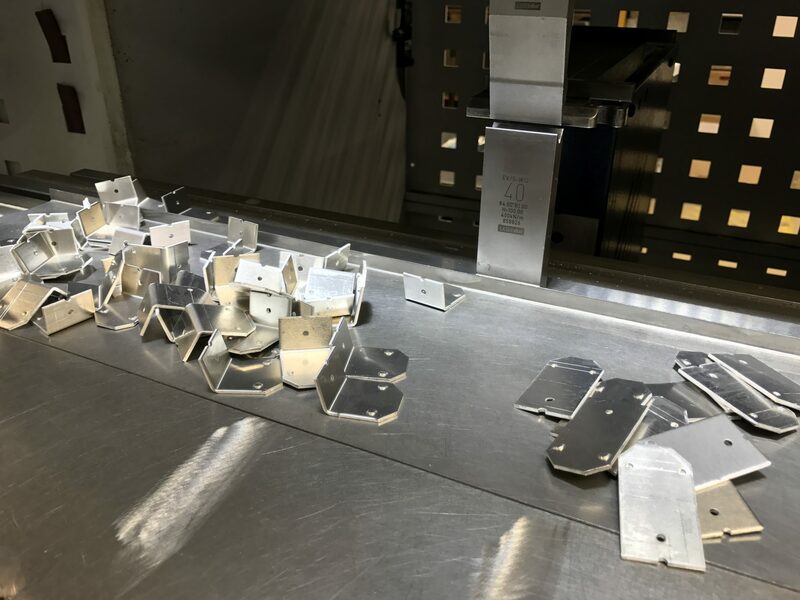 Here we have our Trumpf 200 CNC punch press punching out a thin gauge zinc coated mild steel (zintec) sheet metal bracket with many others from the same 2M x 1M sheet. You can see that the brackets has been spaced 5mm apart so that a standard slitting tool could CNC punch along the left hand and right hand of 2 parts at the same time, a technique known as common line cutting. This simple but effective technique helps us supply sheet metal blanks from the CNC punch press quicker and saves money when quoting for the parts. 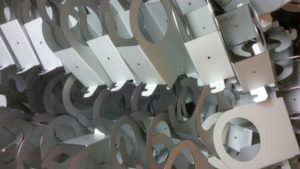 This project was interesting in that we started producing the brackets on our Trumpf 3030 fibre laser and when we had other urgent jobs we simply swapped it to our Trumpf 200 CNC punch press which was more than capable of producing the parts. 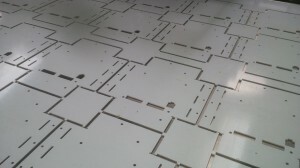 For more examples of V and F Sheet Metal CNC punching sheet metal projects please take a look at our YouTube channel. When we are welding just a few parts for a sheet metal project it’s easy to hold parts together either by hand or with a range of clamps. This is perfect and can produce more than acceptable results and dimensional accuracy. Similarly if the parts to be welded are quite complex or many different parts are being welded together to create a fabricated assembly we might make up a bespoke welding jig with positions of different parts fixed and allowance for shrinkage built into the weld jig. Sometimes the parts are in sufficient volumes to mean we do not want someone helping the welder but a full welding jig would be over the top, this is when the idea of building in location tags is perfect. The tags can be at the edge of a component such as the one shown above or tags into slots when more than one component are being welded together. 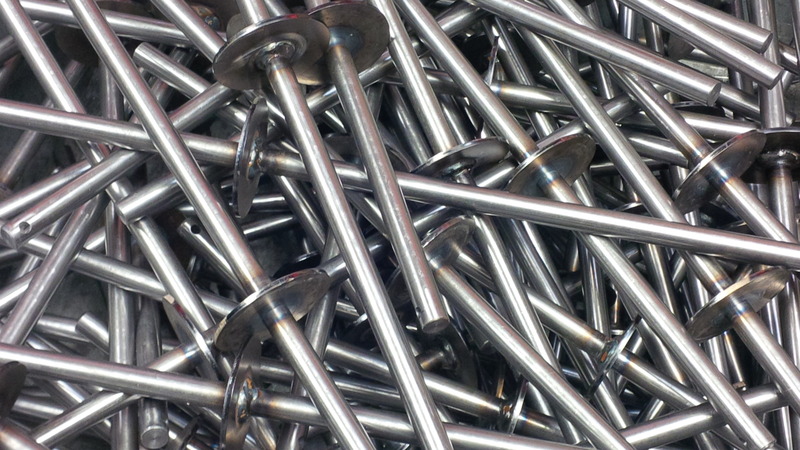 The advantages of using built in tags in the sheet metal parts for production are many. 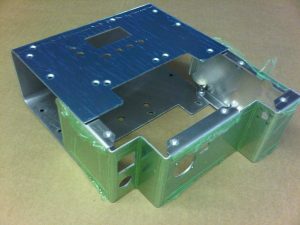 The accuracy can be guaranteed by the CNC punch or CNC laser program using programs like Radan sheet metal design software, the design can be such that parts cannot be assembled the wrong way round by off set tag positions and tag sizes and the tags can be puddle welded to remove any sign that they have been used by us in production so the customer only receives a part to drawing with production assembly witnesses. 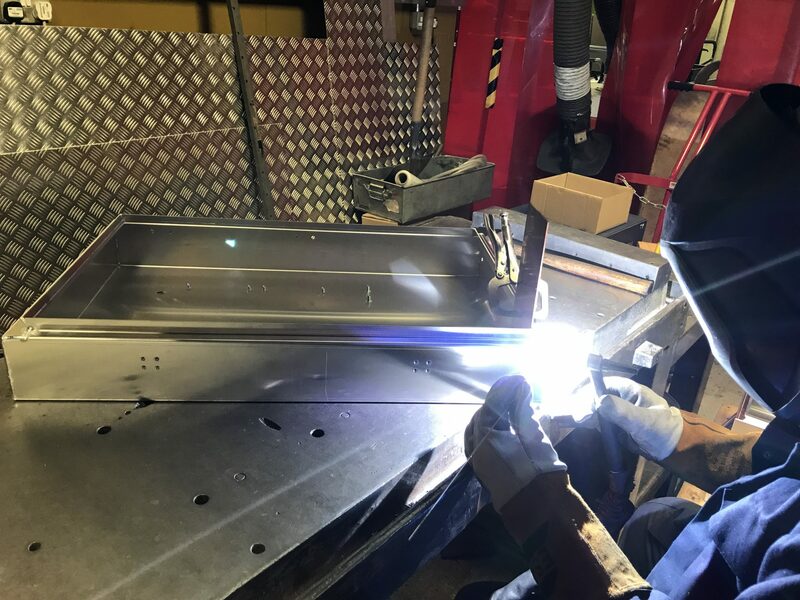 Perhaps you have a sheet metal welding project that might need TiG or MiG welding in ferrous or non-ferrous metal, please call us on 01489 577786 or send us your design ideas to sales@vandf.co.uk and our engineering team will be happy to take a look and suggest methods to save time and money in production where possible. Here our customer needed a really strong chassis housing to act as an enclosure for equipment and as a base tray for all the components above. The equipment they are building has a large motor fixed into this chassis with high torque rates needing this tray to be 4mm thick mild steel. This tray along with its upper housing also acts as a barrier against explosion should the motor fail at high speed. As ever we started this project by taking our customers DXF files and turning them into a 3D model within our Radan sheet metal software. 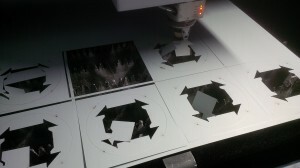 This enables us to create the correct flat blank pattern needed for laser cutting. The mild steel blanks were laser cut from 2500 x 1250 x 4mm CR4 sheet using a nitrogen assist gas to produce a clean oxide free edge to all the cut-outs, slots and outer profile. This was particularly important as the final finished equipment housings were to be powder coated and a good adhesion was required. 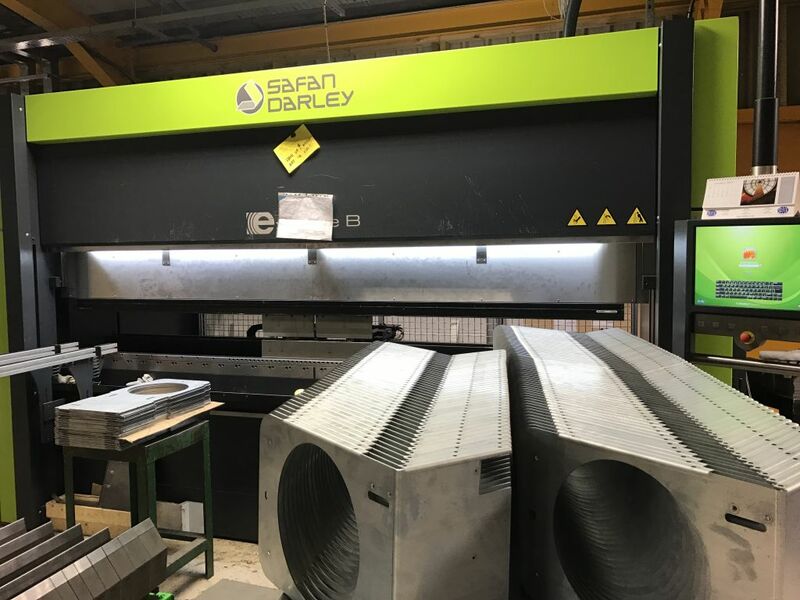 The folding was carried out on our Safan e-Brake CNC press brake and with 100 tons electric motive force there was no problem in bending up the 4mm steel into 90 degree bends. At the stage this photograph was taken the hank bushes had been inserted and it still needed to be welded up, cleaned off and then powder coated. 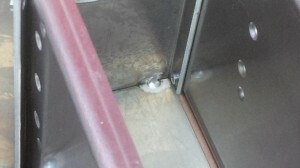 This is simply another view of the same equipment housing showing the corner details. It’s a good example of using the Radan 3D model to enable us to model the type of joint we want to enable us to create an easy weld that has penetration and a V gap built into the design ready for the welders to use without any pre-weld grinding. With the accuracy of the laser cutter we can fine tune this joint to the welders needs and once the weld is cleaned up the housing will look like a continual solid part without any joints under the powder coating. Another feature worth mentioning is the ventilation slots on the left had side of the photograph which have been laser cut to the drawing dimensions. Using a laser cutter we had the freedom to give the customer exactly what they wanted without having to compromise on using the nearest CNC tool or nibbling the slots out. The laser also gives us the ability to easily change the size if the customer wants more air flow with longer or wider ventilation slots without any cost implications. This equipment housing tray was just one of a series of parts all modelled together to create an assembly so that in production all the holes lined up, tolerances worked to enable us to be sure the outer covers fitted on the base and all welded brackets had tabs that fitted into slots to aid production. If you have a sheet metal work project that requires housings and covers in mild steel, stainless steel or aluminium please give us a call on 01489 577786 or feel free to send us your design ideas to sales@vandf.co.uk and our engineering team will be happy to help you explore your options and the best route for manufacturing. If you are looking for a sheet metal work supplier in Hampshire it’s well worth taking a few minutes to review the services offered by V and F Sheet Metal. From CNC punching, demonstrated here, to laser cutting, CNC bending and welding fabrications. We have a range of delivery methods to bring your work direct to your door or if you wish you are always welcome to visit us and see in more detail where your sheet metal work is manufactured. 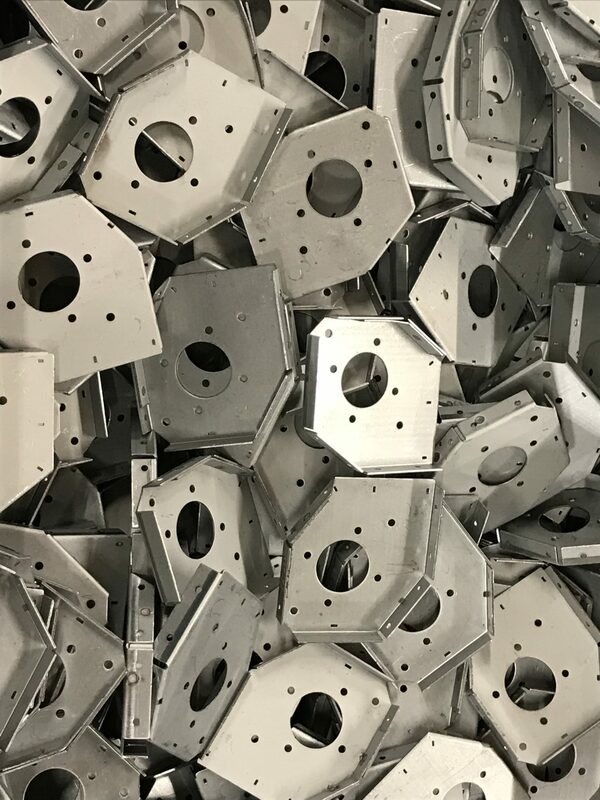 Just take a moment and click on this photo of a nest of CNC punched zintec coated mild steel chassis blanks produced for a pump mounting system. 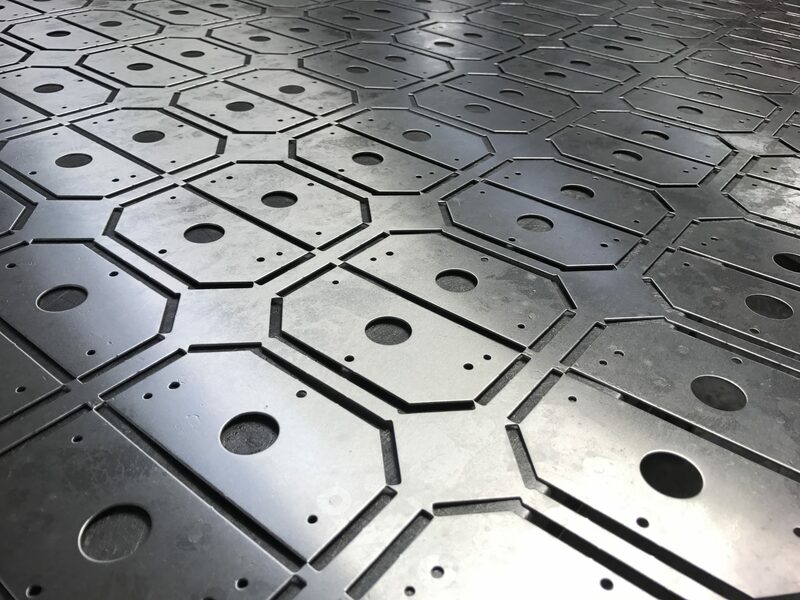 You can see in detail the amount of different shapes that can be produced with a Trumpf CNC punch press using simple standard rectangular tooling. Non of the examples show here in this blog post needed any new tooling when first being CNC programmed so the tooling cost to the customers in each case was zero. This is the case in the vast majority of sheet metal work that we produce here in Fareham, Hampshire using the flexibility of Trumpf CNC punch presses. Any of course we have the ability to put many components onto our Trumpf fibre laser cutter which never needs any tooling so the cost to get your work into production is very low even on small batches and prototypes. A nice simple rectangular front panel required for an electronics assembly. Each front panel has been CNC punched around its outer profile with a 70.0 x 5.0 mm rectangle tool for the long sides and a 10.0 x 4.0 mm rectangle tool for the short sides. 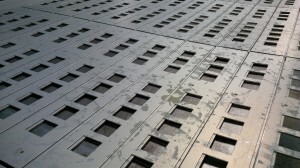 A technique called common line cutting has been employed around the outer profile to reduce the amount of punch press hits and material needed to produce each front panel. By sharing the tool cutting to produce a component and its neighbour at the same time time and money is saved and passed directly onto the customer through a cheaper part. 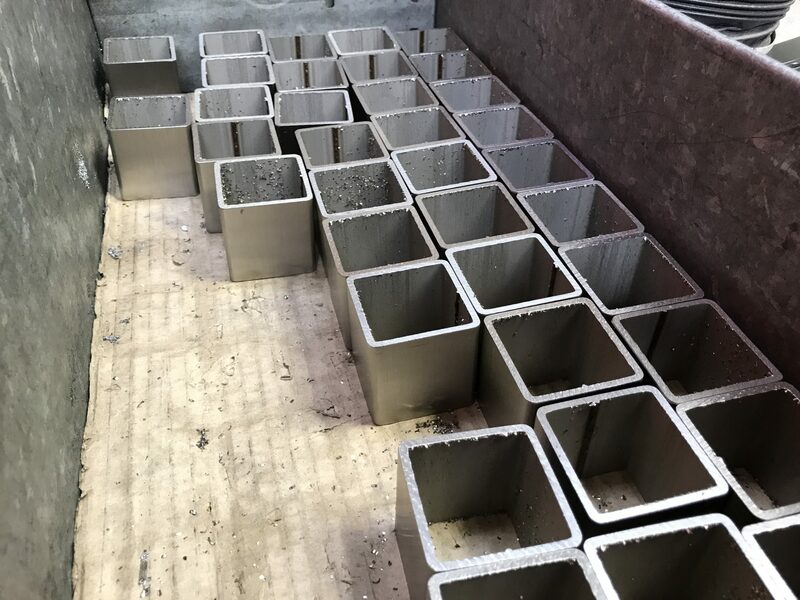 With production of large batches every little advantage that can be produced is worth having and with smaller batched the importance lies with reducing the set up time needed to get a batch of parts into production. 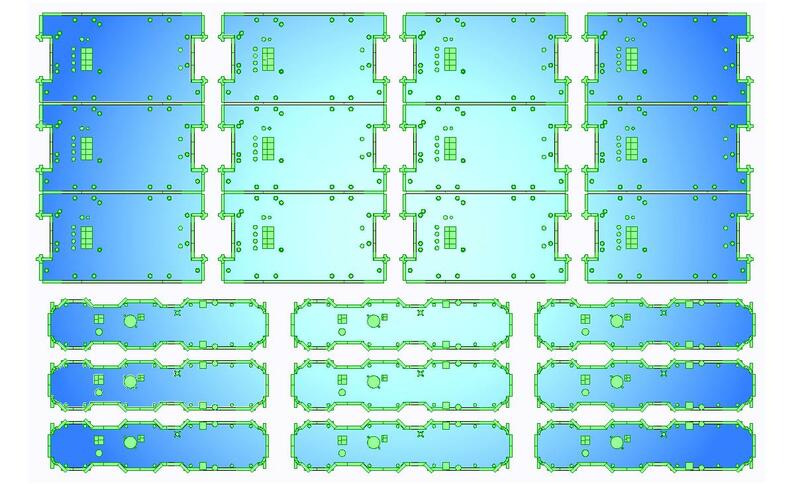 Luckily for us using Radan sheet metal programming software we can quickly try many different ideas and implement the one that is most productive across 2 CNC punch presses and a laser cutting machine. With CNC punching as with all production processes time really is money. 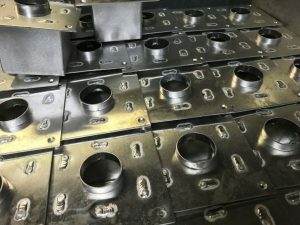 The longer we spend CNC punching your parts the more they will cost so what ever method we can use to reduce punching time is valuable to us and you. Be it common line cutting as above or in this case cluster tools they are all worth examining. A cluster tool is simply a fixed pattern of punches and a die with a series of holes to produce 2 of more holes with one hit. With the right combination of hole patterns a lot of time can be saved which can often pay for the tooling within a batch or 2 of production. As with all the services we offer here from our factory in Fareham, Hampshire we try and supply a balance of design help, accurate production and competitive pricing to help you to keep production on the UK. Give us a call on 01489 577786 for more information or send you drawings to sales@vandf.co.uk for a design review or costing. It’s nice to finish the year with more new sheet metal projects. 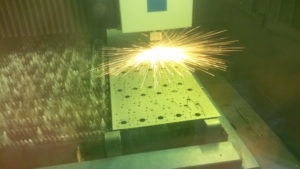 Be it laser cutting stainless steel brackets, CNC punching mild steel light fitting gear trays or laser cutting scientific equipment chassis they have all been produced in December 2015. The range of manufacturing projects made at the end of the year was a good reflection of the wide range of items built across the year for all our customers. To see more about sheet metal work and how we go about making it here at V and F Sheet Metal please follow the link. We look forward to a busy and interesting year for 2016. For all our customers we just want to say thank you and look forward to helping you soon. And if you are not a customer yet please send us your sheet metal ideas, drawings or give us a call and we will be happy to start 2016 off with improving your sheet metal work service. I’m always on the look out for good images to show the range of parts that we manufacture for our customers. 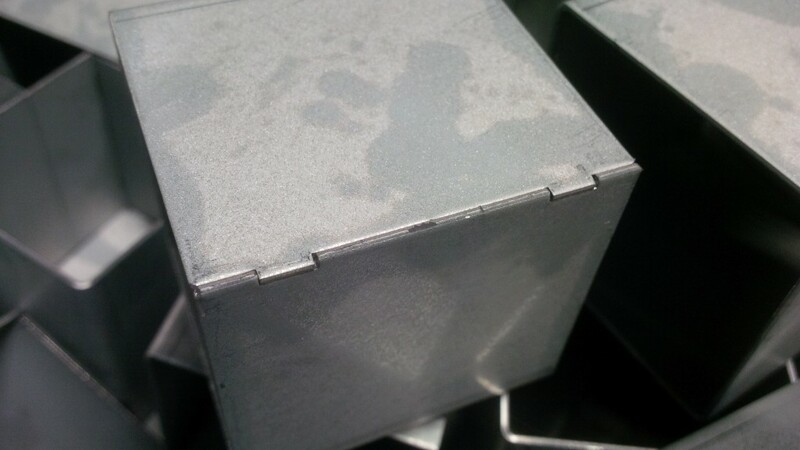 These aluminium boxes caught my eye as they have several production processes to be carried out before the final boxes are ready to ship to the customer. The boxes are a typical example of the work we manufacture from our factory in Fareham, Hampshire, UK. Firstly the boxes were CNC punched out from sheet aluminium to the exact blank sizes calculated by our Radan sheet metal software. The edges were de-burred to remove any sharp sections and then bent up as you see here on our Trumpf 7036 CNC press brake bending machines. The then went on to have M4 bushes inserted, corners tacked welded together and finally powder coat painting. The batch size was 400 which lies in the middle of the volumes we normally produce for our customers. We can cope with sample prototype parts and small special projects to repeat batches for tens and many hundreds through to thousands off for some smaller parts. If this has whetted your appetite to see how V and F Sheet Metal can help you please give us a call or send your sheet metal box project to us on sales@vandf.co.uk and we will be happy to help. Looking for sheet metal assembly, pop riveting, spot welding, mechanical assembly or fabrication welding? 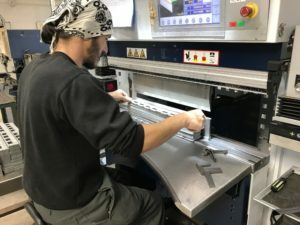 Pressing together sheet metal components using fly presses, spot welding assemblies, tack welding and seam welding ferrous and non-ferrous parts as well as screwing together sets of sheet metal parts. V and F Sheet Metal are happy to take your drawings and offer design changes where possible to save you money and produce quotes to suit the batch sizes you need. Looking for sheet metal workers in Hampshire, UK then please take a look at V and F Sheet Metal Work for a great service and wide capabilities. 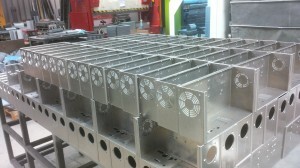 The bulk of the sheet metal projects that we are involved with either start as laser cut parts or CNC punched. These zintec coated mild steel sheet metal blanks have been laser cut with a Trumpf 3030 3KW fibre laser using compressed air to act as the cutting assist gas. The sheet metal parts were laser cut very fast and you can see that the inner sections that are scrap have been cut into a cross so they fall away from the parent sheet and down onto a scrap conveyor below the machine. The final laser cut part was left inside a square which was used as datum point to fold the components and then snapped out at the end before shipping to the customer. 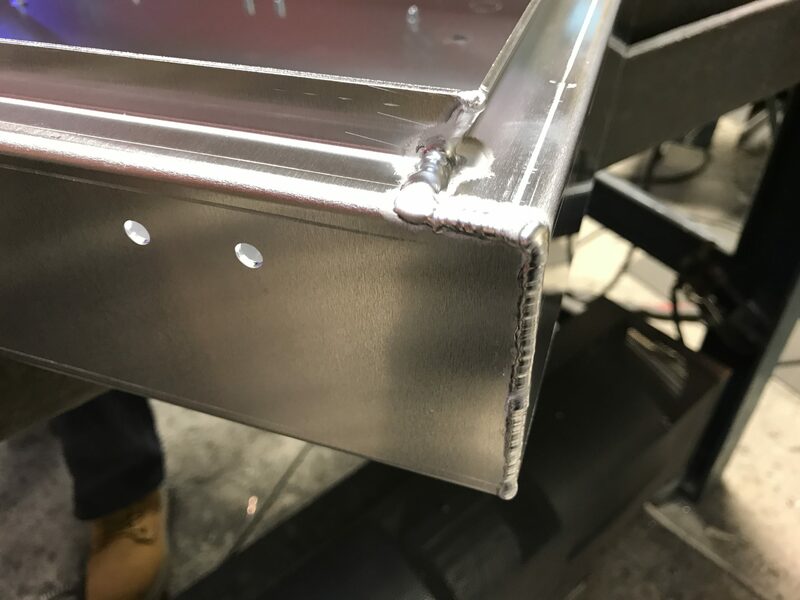 Using sheet metal working techniques like this help us as sheet metal workers to keep costs down and improve the final product. If sheet metal work isn’t laser cut it’s normal CNC punched on one of our Trumpf CNC punch presses. Nearly all sheet metal workers will have a CNC punch press nowadays but not all machines are the same. The design of the Trumpf CNC punch presses lead them to be the perfect sheet metal workers machine when it comes to producing prototype sheet metal work, small batches right through to volume production. The ability to rotate the head through 360 degree and all CNC tooling fitting in the same head enables us to be very flexible when it comes to manufacturing your designs. V and F Sheet Metal have been sheet metal workers in Hampshire for over 30 years and are always happy to look at your sheet metal projects and see if improvements can be made to simplify details and save you money. Please send your drawings to sales@vandf.co.uk or call us on 01489 577786 and our engineering team will be happy to chat. 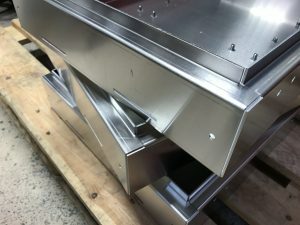 Here we have an aluminium housing for a light fitting with folded sides that needed to be joined to stop the sides being pulled out when is use. The simplest solution was a small aluminium TiG weld in each corner on the inside to lock the corners together. The weld didn’t need to be cleaned up again as the final finished housing was powder coated black and once the cover was screwed on the inside wasn’t seen again. 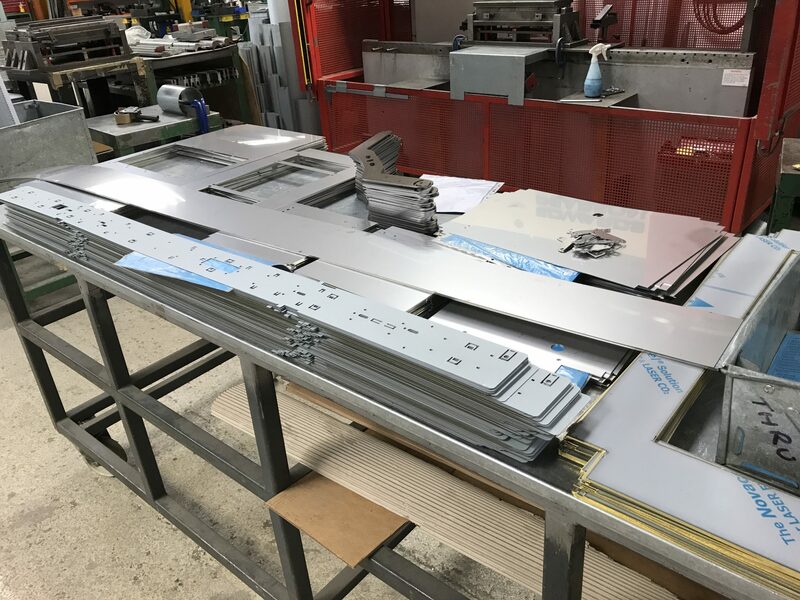 This 3mm thick aluminium sheet metal fabrication, manufactured in our factory in Fareham, Hampshire was produced in a batch of 200 units along with the housing covers. 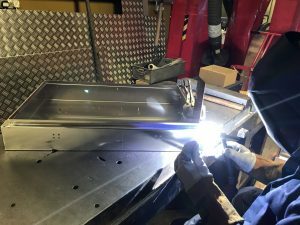 TiG welding is so versatile when it comes to thin sheet metal fabrications and we often use it for fabricating components and assemblies in aluminium, mild steel and stainless steel. 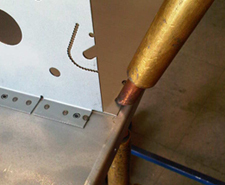 If the gauge is a lot thicker or the weld needs to be larger then aluminium MiG welding is a possible solution. Here we have some sheet metal aluminium trays that have been manufactured from 3mm thick 5251 aluminium alloy in September 2015 with continuous MiG welding along the corner seams. 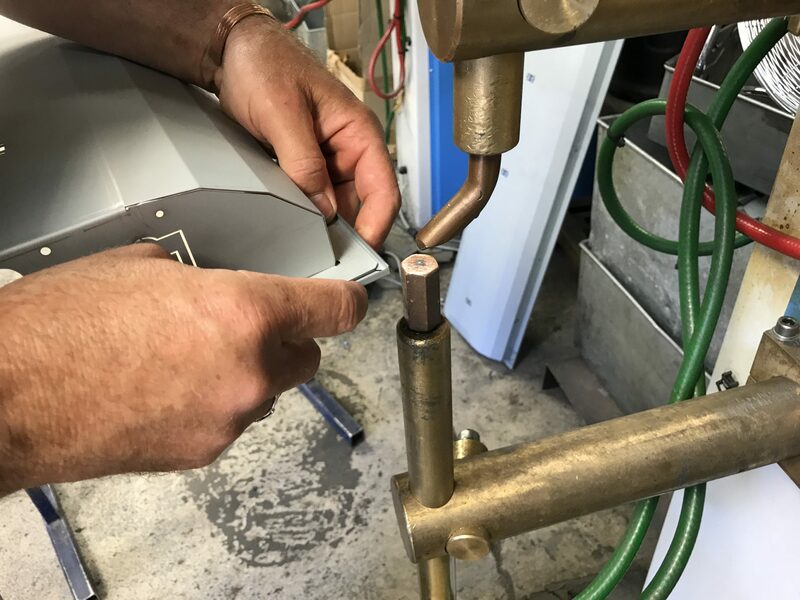 The advantage of MiG welding over TiG welding was the speed that these MiG welds could be carried out and the reduction in heat and distortion. The trays only needed a light sanding off and then they were ready for powder coating. 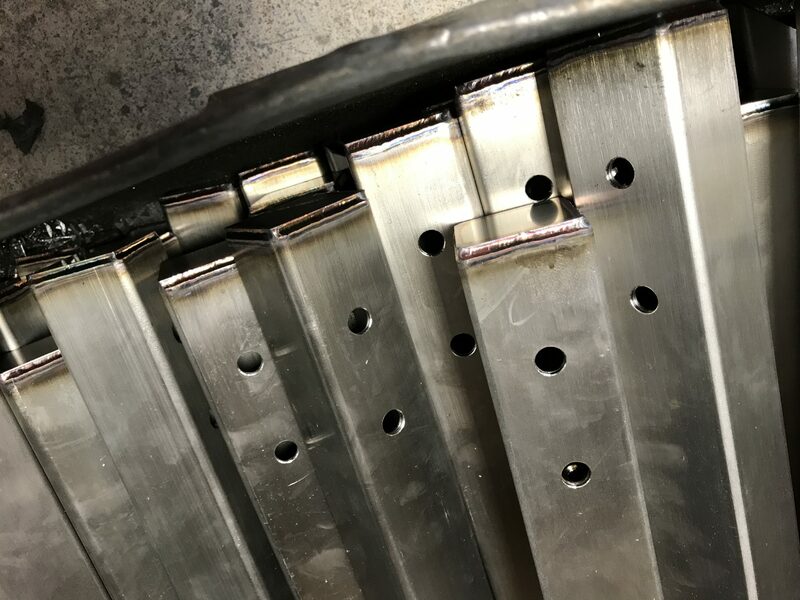 TiG welding can be used for more than just fusing together joints, it can also be used to assemble a series of parts together to create one sheet metal fabrication. Here we have a rolled aluminium ring with a TiG welded joint, flat aluminium plate and folded box section fabricated from 2 L shaped pieces. The final product was a small housing to go behind a ceiling panel, plastered in place to hold a fibre optic light fitting. The small TiG welds did not need to be cleaned off as they were so small and out of sight in the final installation. If you have sheet metal aluminium components or assemblies and they need either TiG or MiG welding please give us a call and we will be happy to review your design and offer a competitive quote. 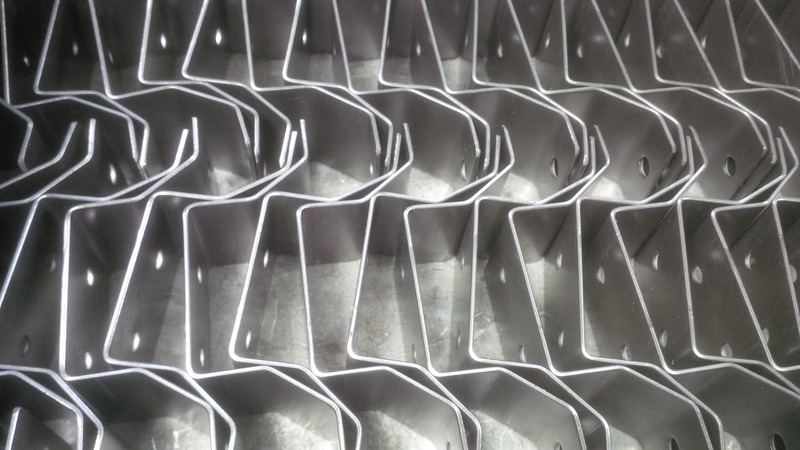 Here’s more sheet metal fabrications manufactured from mild steel in our factory in Fareham, Hampshire. 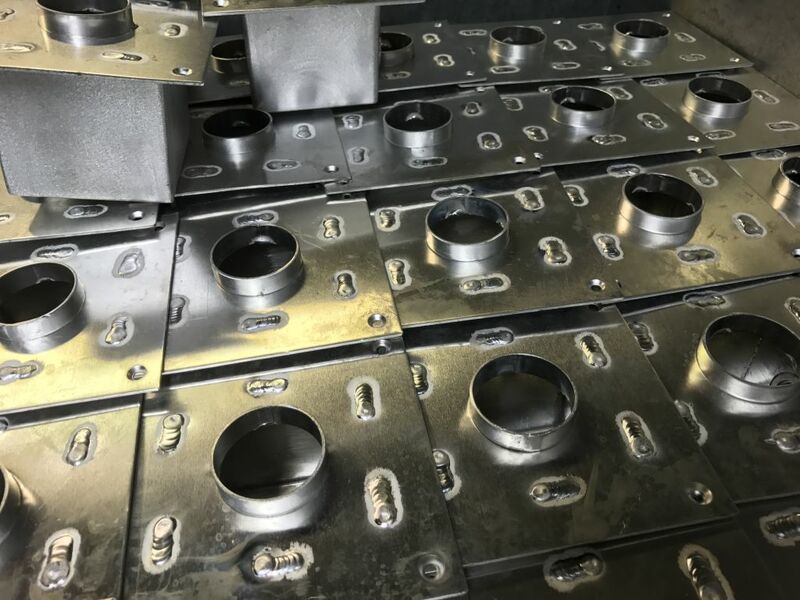 I’m always looking for more new examples of the sheet metal work that we have manufactured and these mild steel housings are a typical example including laser cutting, CNC bending, Tig welding and cleaning up before powder coating. 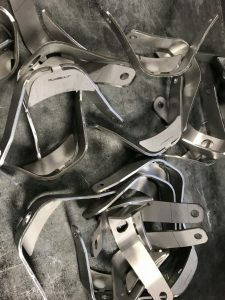 These fabrications were made in a batch of 50 which is typical for small sheet metal fabrications but we also make smaller numbers for prototypes and larger volumes as repeat batches or for large projects. Once the powder coating is applied to these sheet metal fabrications there is no sign that they were ever welded. If you have any sheet metal fabrications you want manufactured please contact us and we will be happy to look at your drawings for you.